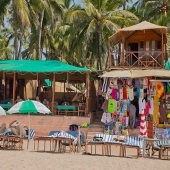 If it happens and you arrive to South Goa, there is one character trait of yours that it is important to determine: Are you a Palolem beach person, or an Agonda beach kinda guy (or gal)? The test is a simple one. You just have to ask yourself – do you feel more comfortable in a secluded, out of the way, community, or are you a person of the big - rushing, keep on changing, always busy – city. If you chose the first option as the one that suits you better, you surely are an Agonda beach person. Agonda beach Goa used to be a getaway beach from the center of happening – Palolem beach and its area. There were almost no beach huts in Agonda, but merely very few small guesthouses, that were mostly occupied by loners, that were seeking to enjoy the beautiful beaches of south Goa, but were also looking for some peace and quiet, that were not always so easy to find on Palolem beach. 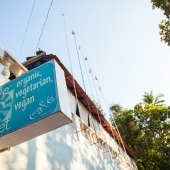 Eating used to be simple – mainly local 'dhaba's, with south Goan food, and maybe one or two restaurants that their menus answered, somehow, to the definition of continental food. Nowadays, Agonda beach is transformed quite dramatically. But in a good way. The season on Agonda beach is still short - when compared to what happens in Palolem - and it starts sometimes in mid November, and lasts only until beginning of April. The beach is still the same magnificent beach, very wide and long stretch, where you can always find many adorable spots, where the feeling is that the beach belongs only to you. So what has changed? The most obvious change are the beach huts that all of a sudden started appearing, without interfering with the general view of the beach. More beach huts means more people, but Agonda is actually large enough to give everyone the sense of semi-solitude they are looking for. Another interesting change is the food. Together with the beach huts (and other types of guesthouses), the food and restaurant scene also grew quite remarkably. 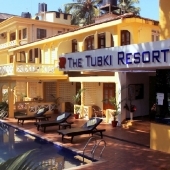 There are very good restaurants that serve very good continental and other genres of food, beside the local south Goan one. 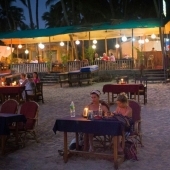 Now, all of those loners, can also enjoy a good satisfying meal, without having to go all the way to Palolem. The main road in Agonda has become a cheerful road planted with shops on both sides - not as big and loaded as in Palolem, but intimate and calm. To conclude, Agonda now has it all – tranquility, solitude and the charm of a fishermen village, together with amenities and the ability to satisfy those simple everyday needs.